Our brand new facility covers over 40,000 square feet and is the largest Patio Furniture retailer in Colorado. 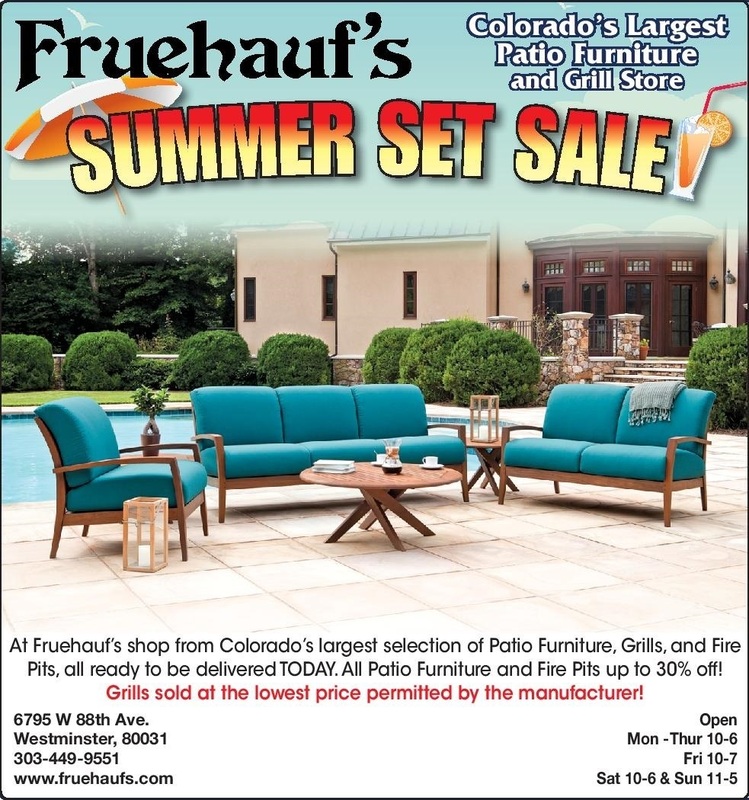 Fruehauf’s Patio Furniture store is open year round and features the highest quality furniture specially selected for standing up to our rugged Colorado climate, and is all available for same day delivery. We carry a large variety of different styles of high quality Patio Furniture from contemporary, transitional to casual. We also carry high quality Patio Furniture made from many different materials. Including: Wrought Iron, Cast Aluminum, All Weather Synthetic Wicker, Synthetic Wood, Stone, Teak Wood, Ipe Wood, Sling, Strap and Cushion. With all of the quality choices available, it will be easy to find something that fits your taste. We proudly feature the top names in Outdoor & Patio Furniture and Grills including: Jensen Leisure, Homecrest, Kingsley-Bate, O.W. Lee, Lloyd Flanders, Gloster, Tommy Bahama, Breezesta, Telescope, Woodard, Pride, Treasure Garden, Fermob, Gensun, Meadowcraft, Patio Renaissance, Ratana, Big Green Egg, Weber, Fire Magic, Napoleon, and many more.